Calzoncelli, chocolate and almond Christmas cookies. Grandma would visit my granddad relatives in Melfi, a mid mountain town in Basilicata, in the South of Italy, about twice a year, in summer and shortly before Christmas. In summer I usually joined her and granddad, but I couldn’t skip school in December, so I would wait for her at home, dreaming about the bags of goodies she would bring back. There was mozzarella, milky, flavourful, shaped in tiny knots, nothing even similar to the mozzarella you could buy here in stores. There was provolone piccante, a hard biting cheese I didn’t appreciate much as a child, but I loved the crescent shape of the slices she would bring us. There were scamorza and the thick salty bread with a yellowish breadcrumb and a dark crust lightly dusted with flour, there were bags of almonds and tiny jars of precious wild oregano. 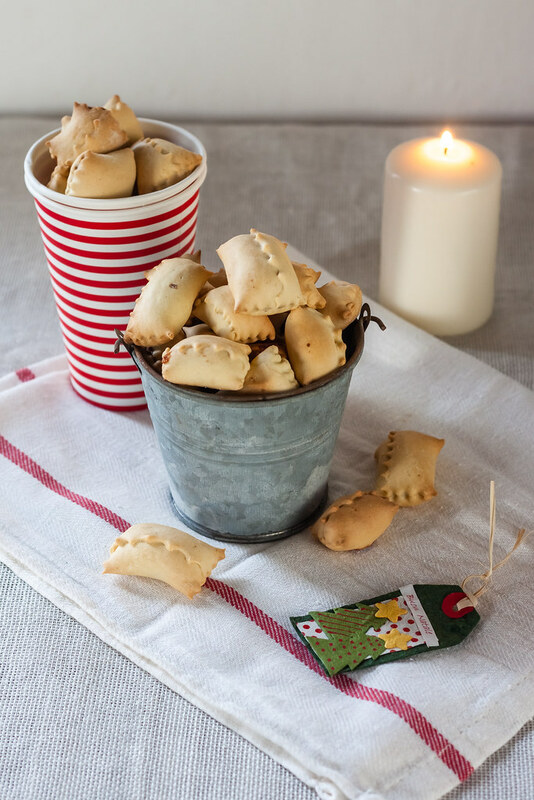 Then there was what I was secretly waiting for, my favourite cookies ever, still my choice if I had to choose among shortcrust cookies, jam or marzipan cookies… there was a big bag of calzoncelli, tightly sealed with a string. She could either buy them in a bakery near my aunt’s house a few hours before leaving, or bring me the calzoncelli made by my granddad’s nieces. It was a feast, and I had to fight over those cookies, because they were not just my favourites, but my father’s, my mum’s and lately, when Claudia arrived, also her favourites! A bag of calzoncelli would last a few days, no matter what the size of the bag was. One in the morning, just before breakfast, one after lunch, one in the afternoon with my usual cup of tea… well, not just one, let’s face it. One after dinner, or even two, watching a movie with my parents on the sofa. Then it would happen, you would tuck your hand into the bag, search desperately for the last calzoncello and find just a few crumbs left. Dad! you got the last one! And my dad, with guilty a look, really? oh I am sorry, I didn’t notice. Sometimes it was me to be so lucky – and quick – to win the last one, and I would answer with the same guilty voice: really? was it the last one? A shameless family we are when it comes to calzoncelli. Luckily we’ve got a treasure, My Aunt Teresa! I’ve told you about her many times, she’s the best cook of the family, the one who brought the Southern recipes into out everyday meals. She began making calzoncelli a few years ago, and now she passed me a special book. 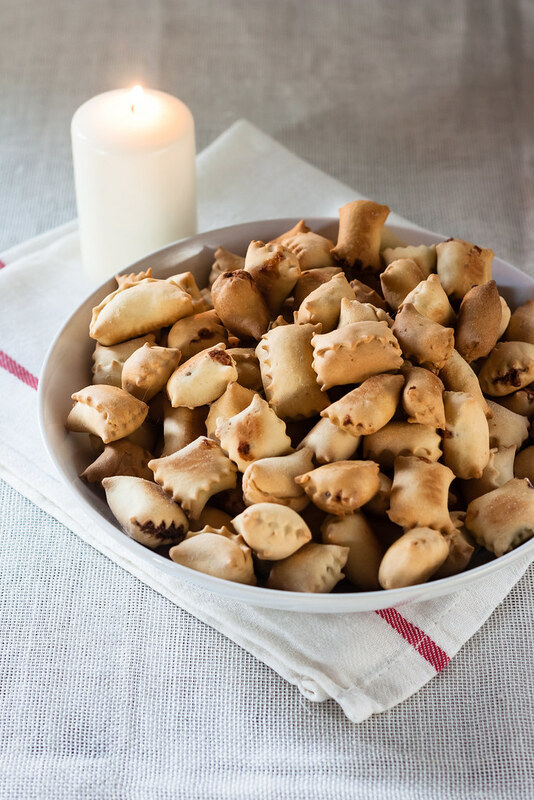 I found the recipe to make calzoncelli in the book she gave me, Le ricette di Nicoletta, a complete collection of fresh and traditional recipes from Melfi. But let’s hit the matter, what kind of cookies calzoncelli are? Small bites of chocolate and almond heaven, with a gentle hint of lemon peel. The outer shell, even if it has to be as thin as you can make it, almost transparent, has an important role in the taste balance, because it is made with olive oil and white wine, becomes brittle and golden when baked, preserving a moist filling. Since they are home made it happens that they are one different from the other, and I’ve always loved the biggest ones, chubby and less baked. Be careful, they are addictive! Calzoncelli are an ideal Christmas gift: you can keep them for weeks in a tin box or in an airtight container – I’m still munching on the calzoncelli I made two weeks ago and they are still brittle and fresh – and even if it takes a few hours to make them tiny, clean and nice, they have this fun parcel shape that is so perfect for Christmas. After all, what are you saying with ad edible gift? here’s my time, here’s my love, here’s my thoughts for you. Make the dough for the outer shell. Pour the flour on a wooden board, make a well in the centre, add a pinch of salt, sugar and the lightly beaten eggs. Start kneading and add olive oil and wine little by little. Keep kneading until soft, elastic and not sticking. Wrap in cling film and let rest at room temperature for at least one hour. Make the filling. Mix all the ingredients and blend until you get a smooth paste. Let it cool down completely and shape with your hands the chocolate paste into long 1 cm thick cylinders, then cut into 1,5 cm long pieces. Make calzoncelli. Roll out the pasta as thin as you can, place the filling pieces on the sheet of pasta at 2 cm distance one from the other, then wrap the pasta around the filling and cut it with a fluted pasta cutter wheel. It will look like a tiny raviolo. Heat oven to 180°C and bake calzoncelli in batches for about 15 - 20 minutes, until golden. You can keep them for weeks in a tin box or in airtight container. The hashtag to follow the conversation on Italian Table talk on Twitter is #ITabletalk or find us also on our Facebook page Italian Table talk. In preparing the filling do you use heat? There is a hint of this in the words ‘let it cool down completely’, but it is not clear how or what is heated….. perhaps the chocolate is melted and the other ingredients blended in…? They sound delicious, plan to test bake them, anticipating success, in which case I’ll add them to my gift list. Hi Robyn the heat comes from the blender, you have to blend it until a paste, so just wait a few minutes until completely cold, no other cooking method is required! Let me know if you make them! Thank you. Not having a blender I didn’t make the link, I read blend as ‘mix together until uniform’ – a blender would do that! I’ll figure out how to make a paste with the tools I have. Can i use a pasta rolling machine to roll the dough… If so what number do you recommend I stop at?? These biscuits look delicious ! Hi Fiona, yes, I used a pasta rolling machine to roll the dough, though the number are different from machine to machine. Let’s say make it really thin, like 1 mm thick, no more! I must have missed that part of your family was from Basilicata – I loved to read these little bits of food memory from elsewhere. Dear Giulia, I am in love with these cookies and I want to make them. They look beautiful and I am sure they are delicious but there are a few things in your receipt I would like to check before I start to make them. The while wine you use, would that be any kind of wine table? For the filling you write that you blend them, so that means you don’t ground the almonds before or melt the chocolate! In my mind I don’t see how you would get a paste by blending these dry ingredients without any liquid and why does this get warm when blending? If you say if does I will try half the receipt for a test. I really love the idea of doing this to offer as a Christmas gift and that is my intention so your guidance is really appreciated. Thank you very much for sharing with the world something so close to your heart. Looking forward to hear from you. Dear Adelina, thank you for your kindest message. As for the white wine, yes, I used a cheap white wine, if you can find a fruity one that would be perfect. As for the almond – chocolate paste, I used a Vitamix food processor, it heated the paste slightly. If you use a common food processor you’ll obtain a paste even without melting the chocolate or grind the almonds, I am pretty sure. If you have other doubts, just ask, I’ll be happy to help you! Thanks, I will follow your instructions. If they work for you they will for for me. Will let you know the results. These calzoncelli (aahhah I love the name!) are a beautiful treat, perfect for this time of the year when we are all so busy with Christmas parties. i have not heard of these. my mom’s family is from potenza so it’s not far away. i’ll have to try them! Oh these remind me so much of celli ripieni except with chocolate instead of jam – and I have to say the chocolate sounds very tempting! The dough is very similar, made with white wine, minus eggs. I found that with celli ripieni you have to be really careful of the dough shrinking when cooking so the filling doesn’t ooze out, is that the case here too? I’m wondering if it helps if the dough is cold to prevent too much shrinkage? Ideas welcome! I was so happy when I found this recipe. I followed the recipe down to the T and yielded extremely disappointing results. The paste was not paste-y enough, it was crumbly, which made it impossible to mold. The dough turned out fine, but if you don’t have a pasta machine, you can forget about it. I basically made a giant mess in my kitchen and gave up any hope of finishing the cookies. I baked about 10 cookies and threw the rest of the filling and dough away. I should’ve read that last comment. The paste wasn’t paste-like at all, I ended up mixing in peanut butter to salvage it and filled the cookies with a piping bag like ravioli. I’ve made these twice so far and they’re amazing! The first time, I had nearly double the amount of filling required so it got saved for my second batch. I’ve been only having 1 problem: how do you get the dough to stick together around them? I’ve been using a knife to cut the dough and using my fingers to pinch it together, since I don’t have a pasta cutter. Would you say the pasta cutter would make the difference? The recepie is amazing! They’re the more-ish cookies that make me want to sit down with the container and eat all of them. I don’t know how anyone could eat just 1! Thank you! I fear it might affect the texture, more than the flavour, but you can try! add it gradually and see! I still can’t figure out how to make the cookies to the shape shown in your photos. it would be very helpful if you could make a video to show us all. I am sorry I am not able to make a video now..Imagine di close them as in an envelope! When using a vitamix did you use the wet or dry container?